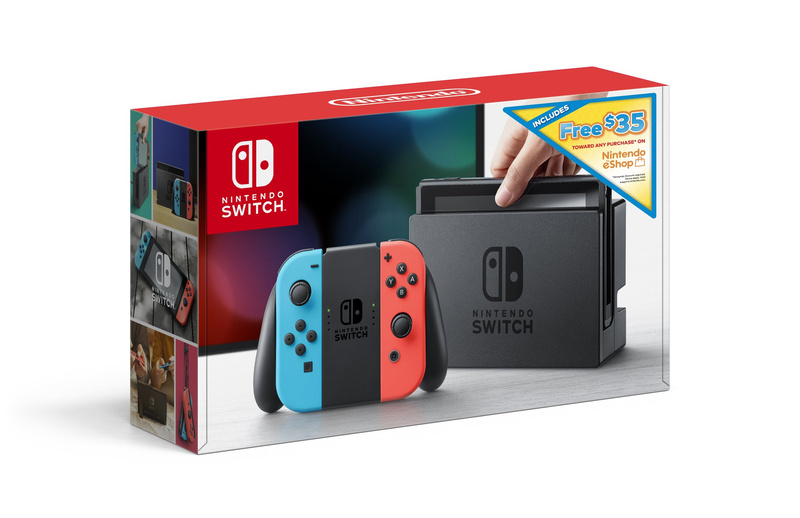 Nintendo of America is set to launch a new Nintendo Switch bundle in retail stores nationwide next week, with a $35 eShop code included. Set to be available for the console's standard suggested retail price of $299.99, this bundle is essentially giving you $35 to spend on any game you like. We often see bundles like this come with specific games - like Mario Kart 8 Deluxe or Super Smash Bros. Ultimate, for example - but the option to spend your cash on any you game you like is a nice touch. If you're yet to secure your own Nintendo Switch and are thinking of taking the plunge, this could be a great time to do it. If you need some inspiration for spending that extra money, check out our favourite eShop games of January 2019 - you're sure to find some winners in there that you may not have heard of. A good retail option? Or do you prefer bundles with full games included? Let us know your thoughts in the comments. Not a bad idea; some might argue they should have a $59.99 code to allow for the full price major title of your choice but I imagine some 3rd parties may not like that. The $35 will be for Switch Online service with price $20, we got $15 after signed up the Switch Online service for 1 year. $35 eShop credit to spend as you please is a nice thing indeed, since game prices can fluctuate and even first party Nintendo games DO find themselves on sale digitally now. This is a good bundle, it's quite generous that they're giving buyers this much eShop credit right out of the box. A good way to promote their eshop and give users the freedom to buy anything they want. @Anti-Matter You don't need to be part of the paid service to access the eshop. They can use the full $35 on games. Pretty nice deal and it incentivizes eShop purchases. I work at Target, and I can confirm that we do indeed have these. Pretty cool deal for new Switch owners. Buy a Switch, get Hollow Knight for free! And you still have 20 bucks left to buy another great game or two! Hmmm....I like it! I could pay Nintendo Switch online service for free. Very tempting but I will hold off for the eventual (God willing) Animal Crossing bundle. I have made the mistake in the past with owning only one console and one copy of the game (Gamecube and Wii) and will not make that mistake again with the Switch. Resolved that problem real quick with the 3DS and Animal Crossing. The arguing and complaining got so bad that I eventually bought a 3DS and a copy of Animal Crossing (both of them) for the wife and the kids. @Painkiller_Mike : I imagine that will be an inevitability, complete with light green Joy-Con, a themed dock, and patterns on the Switch console itself. Nintendo seems to be stingy on switch bundles and discounts, we're 2 years in to the switch life cycle and all we have is a mario kart bundle and this. (The other bundles all costed an extra $60). I'm calling it now, Animal Crossings Switch Mini bundle in 3rd quarter 2019 leading up to the holiday season. Well, it's better than getting it with 1-2 Switch. A Nintendo Switch bundle with Rocket League & Stardew Valley? Sweet! @Silly_G I want it now. I bought my wife the Animal Crossing 3DS when it released and I'm still jealous to this day. Will this deal be available over Amazon? Cool deal. My friend is getting herself a switch in a couple weeks and has been looking for a good bundle. If you don't have a Switch yet there's almost no reason not to get one now. That's nice that Bowser is looking out for us! This is actually similar to a few of the holiday deals that were circulating after the main Black Friday deals were done. As I'm still Switchless, I'm mildly tempted by this one. Maybe they'll still be available in a few months? @Blitzenexx Judging by Nintendo’s limited time Switch offers in the past, this probably won’t last a month. @GyroZeppeli: Eh, it's hard telling. I don't think I'm looking at a Switch until at least this summer lol. I'm sure something else will come along if this deal is gone before then. Basically a 35 dollar discount. Nice! OK, but I'd rather just have Smash Bros. bundled with it for a whole $60 of extra value. What they should be doing is a bundle with an online game (Smash, MK8, etc), provide $15 credit instead of $35, and give 30 days free of Nintendo Online. That way the customer gets a bit of a discount for an eShop purchase, plus they also get hooked online and will likely renew the Online service. That will provide a continuous payment to Nintendo, rather than just a one-off purchase from the eShop. Another red and blue Joy Con Switch on the market? Heck Yes! The credit is a nice bonus but I really don't want to settle for gray Joy Cons, which are all I can find at the moment. You DON'T need to pay $20 for Switch Online service to enter Eshop menu and browse some games over there. You NEED to make account first before entering Eshop menu. You need to spend $20 for Switch Online service if you want to play Online for some Switch games such as ARMS, mario Kart 8 Deluxe, Splatoon 2, Fortnite, etc. @Anti-Matter ok. So I prob will get it but if I just want to buy a game I can do it without signing up? Well, after you make an account you can enter the eshop menu and purchase digital download games over there without signing Switch Online service. Be careful with some eshop games with "Internet required" mentioned from eshop menu such as Fortnite, Get Amped, Paladin, etc because those games are FULL Online games (Cannot be played Offline) with Switch Online service requirement.